On the surface, Azerbaijan is an oil rich nation -- home to soaring skyscrapers, luxurious lifestyles, and a booming nightlife. But the wealth and abundance in the capital city of Baku doesn't mirror the rest of the country. With high inflation rates and the long-term displacement of over 700,000 people by the Nagorno-Karabakh War, 11% of the population lives below the international poverty line. 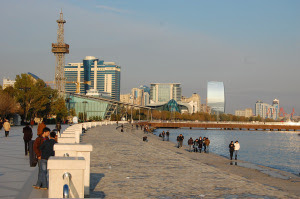 The Bulvar, Baku’s seafront promenade. 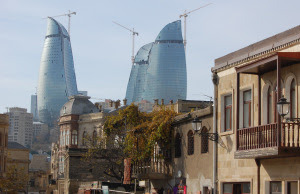 Finding credit to start a business in Azerbaijan is a complicated endeavor. There are many government loopholes and corruption runs deep. In this environment, microfinance is a powerful tool for starting small businesses. The Flame Towers, a group of three glass skyscrapers. MIX Market is one of the best resources for getting a handle on the microfinance industry in any given country. An index of the top microfinance institutions (MFIs) around the world, it gives a sense of the scale and impact small loans are making. 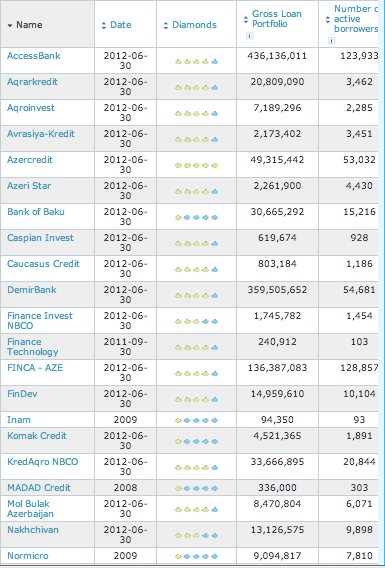 According to MIX, microfinance institutions operate in about 82% of Azerbaijan's 66 districts. And there are 390,000 active borrowers with $937 million in outstanding loans across 27 MFIs. Out of these 27 institutions, Kiva partners with three: Aqroinvest Credit Union, Komak Credit Union and VisionFund AzerCredit. Founded in 2001 by a group of 32 Imishli farmers, Aqroinvest Credit Union has grown to become the largest credit union in Azerbaijan. Its mission: to help vulnerable, low-income communities -- mainly rural farmers, internally displaced people and refugees. Since partnering with Kiva in 2007, it has funded $3.7 million in loans to 2,814 borrowers on the site. The average loan size is $1,399. I had been told that Baku and the rest of Azerbaijan were like night and day, that one needed to travel out to “the regions,” as rural Azerbaijan is known, to truly grasp the plight of the country’s poor. This was true – but it also struck me as simplistic. There are wealthy people in the regions too, and I was sure there were thousands of others here in Baku who had been cut out of the city’s renaissance. I’d traveled 6,000 miles from home to find these people and, in some small way, to help them raise themselves from poverty in a city notoriously unforgiving to the poor. 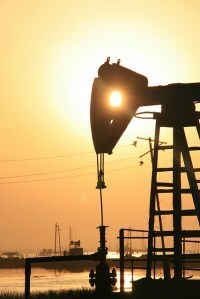 A nodding-donkey oil pump on Azerbaijan's Caspian coast. Another fellow, Ivan Ledyashov, worked with both Aqroinvest Credit Union and Komak Credit Union. His perspectives on microfinance and poverty were also impacted by his time in the field. 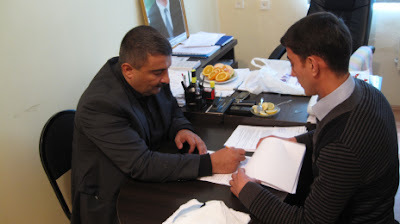 AqroInvest's CEO signing loan contracts. "It was an amazing experience to meet the borrowers who came into the branch offices to pick up their loans," he posted to the blog. "It made microfinance so much more real for me. I consider witnessing AqroInvest’s staff at work the highlight of this entire experience." Komak Credit Union was established in 1999 by 20 union members and has since grown to serve over 1,800 -- mainly women and internally displaced persons. Since partnering with Kiva in 2006, Komak has funded over $3.3 million in loans to 2,175 borrowers on the site. Still in the pilot phase of Kiva partnership, VisionFund AzerCredit focuses on both the urban and rural poor, providing loans to small businesses and self-employed borrowers. Its 24 branches serve 40,000 clients and cover remote areas that previously had no access to financial services. Since teaming up with us last year, AzerCredit has lent $127,575 to 95 Kiva borrowers. We're thrilled to be working with several socially-driven organizations in the country to bring credit to the people who need it most. Stay tuned to the Kiva Blog for the last installment in this month's Passport Series on Azerbaijan. This is the second of a three-part series looking at the country's history with microfinance, Kiva's role in expanding opportunities for its people, and what it's like to participate in the country's economy as a borrower, lender and field worker.